Tom Baker's 4th Doctor from Doctor Who. From the creative minds of Funko and Playmobil, comes a collaboration meant to be collected! 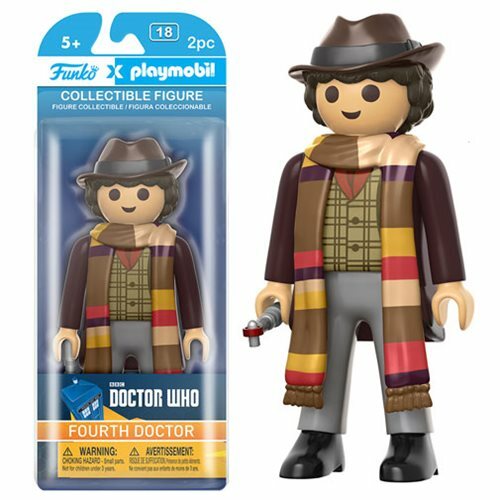 From Doctor Who, this 4th Doctor figure combines Funko's take on the classic character with Playmobil's iconic body design. He includes a sonic screwdriver accessory piece. The Doctor Who 4th Doctor 6-Inch Playmobil Action Figure is also scaled up from the traditional Playmobil size and measures approximately 6-inches tall, packaged in a blister card. Ages 5 and up.